Green PCIe risers are better than Black PCIe risers. At least we think so and so do some of our best customers! 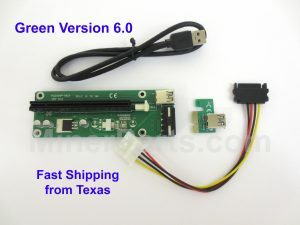 We’re switching all orders over to Version 6 Green PCIe powered risers. 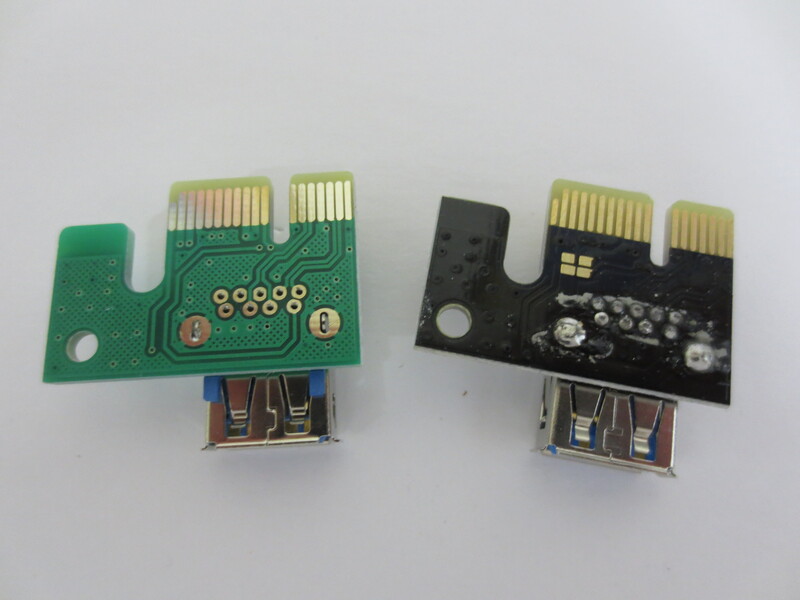 You can see from the image above the 1x PCIe card that connects the USB cable to your motherboard. I’ve flipped both cards over so you can see the soldering on the back. These are both brand new risers taken straight out of the anti-static bag! The green card is neat and tidy. Clearly whoever put it together took their time. The black card is messy. It looks like extra solder is smeared on the back of the card. One of our customers has over 3 GH of Ethereum mining equipment. He was the first person to tell us about the problems with the black risers. He was experiencing intermittent issues. We sent him some replacements and he compared the two. The green riser was superior. Green risers clearly have a better build quality than the black ones. It is easy to see from the image at the top of this post. There are other minor deviations between black and green risers. We feel that in general, the build quality of the green risers is more professional and detailed. Green risers seem to be better quality and less likely to fry your equipment. We’ve notified our vendor we only want to buy the green risers in the future! What to do if you have a bad riser? We stand by all our product. If a vendor starts to send us a bad product we’ll find a new vendor or get the issue squared away. We’re also happy to ship replacements to our customers! We’d love to know what you think? Have you had any problems with the green version 6 riser or the black version 6 riser?